Boil the Elbow noodles. While the noodles are boiling, whisk the eggs, milk, salt, and dry mustard. Strain the noodles. 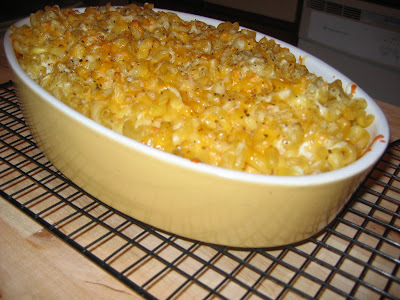 In a large casserole dish (such as the one shown above) layer the noodles and the cheese. Before sprinkling the last layer of cheese, pour the liquid mixture over top. Sprinkle the remaining cheese. Cook at 325 degrees for 40 minutes. Variations: The recipe calls for 2 cups of cheese, but if you are trying to put meat on someone's bones, use the entire block. I like to use sharp cheddar, and I also grate pepper over the top for an added kick. Keep us posted on your whereabouts! I will definitely have to make your mom's mac and cheese for our thanksgiving dinner or...just once a week! This looks so yummy!! I love your blog, very cool! My hubby is going to LOVE this recipe! Won't the family love this! I think they could live by mac and cheese alone. Good luck choosing a place to live. I've been married 13 years and still struggle with that decesion after 10 moves in 5 states. Thanks for stopping by my blog. It was wonderful to meet you & I enjoyed the visit here.